Many fast-growing breweries looking for a way to package their beer without the capital expense of purchasing their own packaging line have embraced the flexibility of a mobile beer-canning service. As I walked through the loading doors at Eagle Rock Brewery (Los Angeles, California) one recent autumn morning, the din of beer-making was even louder than usual. I’ve observed many packaging runs at the small brewery over the past few years, but on that day the brewery’s trusty Maheen four-head bottle filler was tucked away. Instead, the steady thrumming of an air compressor mixed with the clicking and whirring of a canning line. Eagle Rock Brewery has increasingly embraced cans as a packaging method as the marketplace in Southern California has cooled on the 22 oz bottle format. But Eagle Rock couldn’t have transitioned many of their special release and year-round brews to 16 oz cans without the service offered by Beer Monks mobile canners. The Beer Monks—Greg Kinne and Mike Nalick—launched their business in late 2013, and they now package beer (as well as cider and wine) for more than two-dozen breweries and other businesses in Southern California. At the center of their operation is a Wild Goose 250M mobile canning line. The impressively engineered machine can fill and seal almost forty cans per minute, cruising through a 15-bbl brite tank of beer in just a few hours. Equally impressive is the efficiency with which Kinne and Nalick operate the system. It takes the team only about an hour to load the 700 lb, 90" (2.3 m) long machine into a brewery, run a clean-in-place routine, and hook up to a brite tank full of beer. At the end of a canning run, the partners can have the machine cleaned and packed back onto their truck in just about 90 minutes. Many fast-growing Los Angeles breweries who looked for a way to package their beer without the large capital expense of purchasing their own packaging line have embraced the flexibility of Beer Monks’ service. Kinne and Nalick first met while working on a search-and-rescue team in the mountains east of Los Angeles, and the two homebrewers soon started looking for a way to get involved in L.A.’s blossoming beer industry. “We didn’t want to open a brewery,” Nalick says. “We looked at it from a Mark Twain perspective: how could we sell pickaxes in [this] gold rush?” The question led the partners to Colorado’s Mobile Canning Systems—a company that provides support, equipment, and other business needs to a nationwide network of more than eighteen mobile canning companies. MCS provides training for the operators who travel to Colorado for a two- or three-day training course and also acts as a single point of contact for the sourcing of empty cans and artwork—allowing small breweries to purchase cans one pallet at a time instead of a full truckload, which is the common minimum order for screen-printed cans. Kinne and Nalick became an early affiliate of MCS and purchased their Wild Goose canning line in 2013. 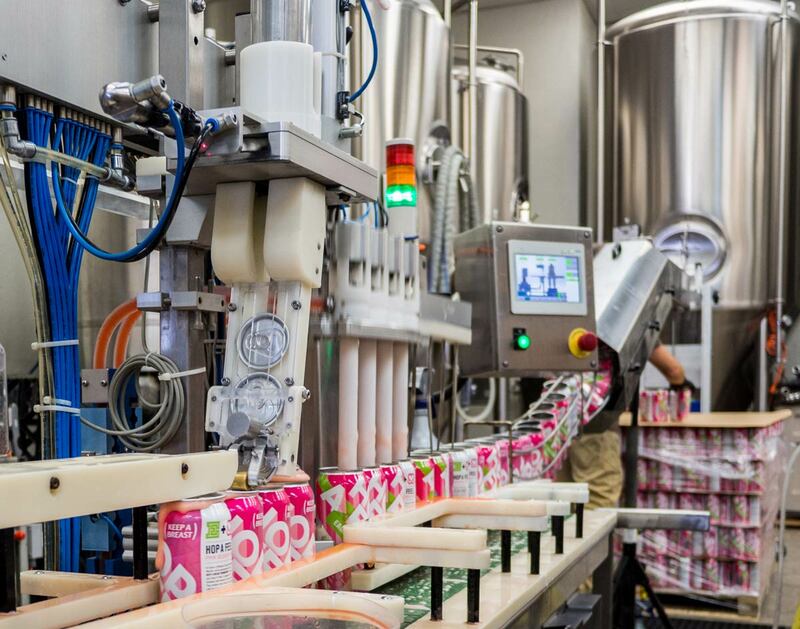 The canning line itself is a complex machine with innumerable hoses, cables, sensors, and nozzles, but the process of canning on the Wild Goose 250M is relatively straightforward. While one person can operate the machine, it goes better with two (especially the setup and teardown). The main operator stands in front of the line and monitors the fillers to ensure consistent and accurate fills. Another operator feeds cans into the line, while the host brewery supplies a few hands at the end of the line to snap on the plastic can carriers, pack the 4- or 6-packs into cases, and palletize the packaged beer. The line can package about 100 cases of beer an hour at the fastest, and the Beer Monks can handle between seven barrels and thirty barrels of beer in a run. Starting with a pallet of empty cans (that can be blank and labeled post-filling, preprinted, or adorned with a shrink-wrapped label), one operator loads the empties into a track that moves the cans down the line. The empties are first flipped open-side down and sprayed with sanitizer before being flipped upright again and tracked onto the main conveyor belt. The first stop on the line is the four-head purge station that fills the cans with CO2 to minimize the beer’s exposure to oxygen (above). Then, the four-head filler drops into the cans and begins to fill from the bottom up (above). The main operator controls the flow rate by tightening or loosening a clamp that constricts the incoming beer lines at the rear of the machine, and all number of other variables are adjusted via a touch-screen control panel. Learning to operate the line takes time and, above all, experience—the biggest challenge of running a mobile line instead of one installed at a brewery is having to juggle all the small variables. “There are so many ways beer can behave and so many moving parts, getting things dialed-in can be tricky,” says Greg Kinne. Eagle Rock Brewery Founder Jeremy Raub says that while the margin on ERB’s canned beer is slimmer than beer bottled on the line the brewery owns, the novelty of canned IPAs means the cans sell much faster than bottles of the same brew. “You don’t deposit margin in the bank,” he says with a shrug. Besides slightly higher costs, ERB’s Packaging Manager Thomas Lee Bakofsky says the biggest downside to outsourcing is a lack of control. “It’s a part of the process that you want to fine-tune, but you don’t have control over it,” he says. The logistics of designing and procuring cans is another challenge, but one that lessens with each batch the brewery cans. At the end of a day’s canning, the Beer Monks run a report from the line’s control panel that shows a count of cans seamed, subtracts the low-fills and other cans that failed QC, and charges the brewery by the number of cases. Then every square inch of the machine is sprayed, sanitized, and wiped down. They keep an extensive kit of repair parts and tools on their truck, and some worn items are replaced before the line is packed for transport and rolled back onto their truck. It’s physically and mentally demanding work, but the duo says their time working search-and-rescue together prepared them for the long days, thinking on their feet, and teamwork that’s needed to run the successful business. 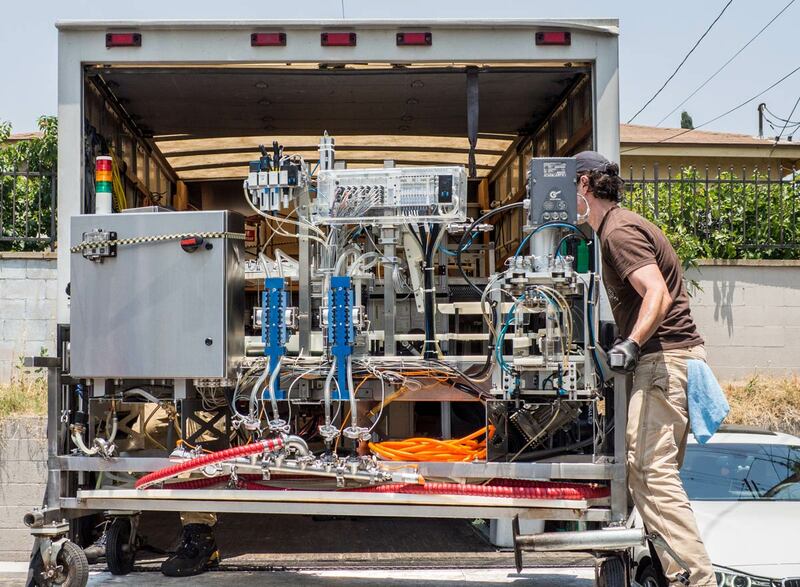 Recently, Kinne has been taking the position behind the control panel more often as the Beer Monks prepare to add a second truck canning line to serve L.A.’s breweries. The beer pictured in the canning-line shots has an interesting story. Brewed in collaboration with the Keep A Breast Foundation (keep-a-breast.org) during Breast Cancer Awareness Month, Eagle Rock Brewery’s Hop A Feel was tinted pink with almost 200 pounds (91 kg) of fresh beets added to the mash. The beer was the centerpiece of several fund-raising events throughout October 2016, and $2 of every 4-pack of Hop A Feel cans sold were donated to the Keep A Breast charity to help with the foundation’s mission to “equip young people with breast-health education early on in their lives.” The 4.5 percent ABV hoppy ale was a striking pink hue and aromatic with Amarillo and Simcoe hops. As for the beets, besides the color, the roots did add a faint earthiness in the background of the easy-drinking ale.